I found the article for the SNES version of the game while browsing random pages and I saw that dinosaur. I laughed. I then went to GameFAQs to see if there were any passwords listed there. They had several passwords that enabled cheats in the game, so I thought... "I'll look for some of these passwords in the rom" thinking it wouldn't work. 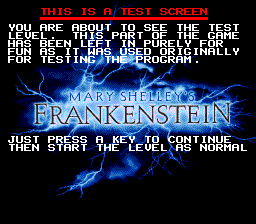 THEN START THE LEVEL AS NORMAL. 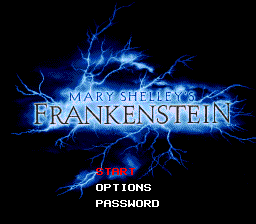 So I enter it in the password screen. Check this out! 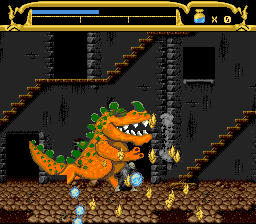 The game boots up in the very first level... with two big orange dinosaurs walking around. There's also two clones of you. The one on the right just walks around, but the one on the left shoots out flames and sparks if you hit him with your stick. There's also a torch where you can light your stick on fire for some reason. 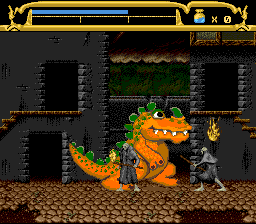 If you smack the Frankenstein that shoots out effects while the dinosaur is in the screen, parts of the sprites will vanish. I'm not sure if this is an emulator issue or not. And you can't leave the area since there's no elevators, so you have to reset the console to exit.